On March 20-21, a unique opportunity presents itself for clinical practice guideline (CPG) developers, implementers, consumers, and health professional stakeholders from Canada, the United States, and Mexico. The Evidence-Based Guidelines Affecting Policy, Practice, and Stakeholders (E-GAPPS III) conference, hosted and co-sponsored by the NYAM section in partnership with GIN NA, will provide presenters and attendees an opportunity to explore key challenges to the future of the clinical guidelines movement posed by the emerging climate of uncertainty surrounding health policy and services in North America. To this end, it will incorporate several innovative elements to enhance attendee participation, increase value, knowledge, and networking, and forge new commitments for collaboration and engagement across participating stakeholder groups. It will convene the day after a one day ‘summit’ conference sponsored by Consumers United for Evidence-based healthcare (CUE). 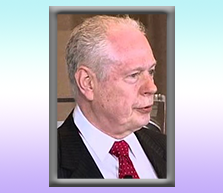 It is hoped that many attendees, including consumers, will attend both events. The signature theme for E-GAPPS III is “Beyond Implementation: Are Clinical Guidelines Improving Healthcare Quality?” The opening keynote speaker will be Dr. Elizabeth McGlynn whose landmark article in 20031 powerfully documented the gap between evidence-based clinical policy and the health care actually delivered to the public in the US. Although her study has not since been repeated in the US, evidence regarding the care of patients with heart failure internationally does not encourage the idea that the gap has closed in the last 15 years.2 In both cases, the percentage of patients receiving evidence-based, guideline recommended care was observed to be in the neighborhood of 50%. McGlynn and others have voiced concern for the inefficiency and ineffectiveness of the approach to quality measures within today’s healthcare system.3-5 E-GAPPS III will provide an opportunity for an elite group of guideline developers, consumer and practitioner stakeholders, health system administrators and policymakers to engage in dialogue regarding the ways that the guideline movement can help bridge the quality gap within the emerging environment of political and fiscal constraints. Clearly it is no longer merely a question of the “what” of guideline recommendations but of the “how” and “how to.” The voices of stakeholders will be crucial to listen to for efforts to succeed. The parallels between the E-GAPPS conference and the CUE Summit produce natural harmony between these sister events. Consumers particularly are encouraged to attend both, learning how to participate in guideline panels and connecting with those who might offer possible future opportunities. Guideline developers will learn how to make consumer engagement more meaningful and successful, while also increasing their list of patient and caregiver contacts. The final half-day is designed as an “unconference,” in which everyone is an engaged participant. There will be no didactic presentations. The attendees will select the topics and may move from room to room to participate in more than one conversation. There are no pre-designated speakers for this semi-structured “open space” designed event. All conference attendees, including plenary and breakout participants in the earlier segments, will take part. All attendees will initially convene in the large open plenary hall and discussion will incorporate ideas and issues raised in advance via social media and throughout the conference using a conveniently located message board. Breakout rooms will then enable separate self-organized discussions with groups of interested individuals. Some may be interested in learning more about a topic, while others will be more familiar with the challenges and opportunities of that topic. All will be equal partners in these interactive discussions. A principal objective of E-GAPPS III is to consolidate commitments for new collaborations that can be followed and verified during the conference aftermath. A recurring goal of G-I-N North America, as well as previous E-GAPPS conferences, has been to increase guideline collaborations and harmonize recommendations. The explosion of guidelines addressing the same clinical questions but reaching different conclusions has created confusion and chaos at the point of care. Increasingly stringent standards for guidelines have increased development costs. Collaborations between developing organizations could harmonize the recommendations and allow sharing of resources so that more and better guidelines can be produced. Yet, the North America guidelines community struggles to resolve some of the challenges of collaboration. 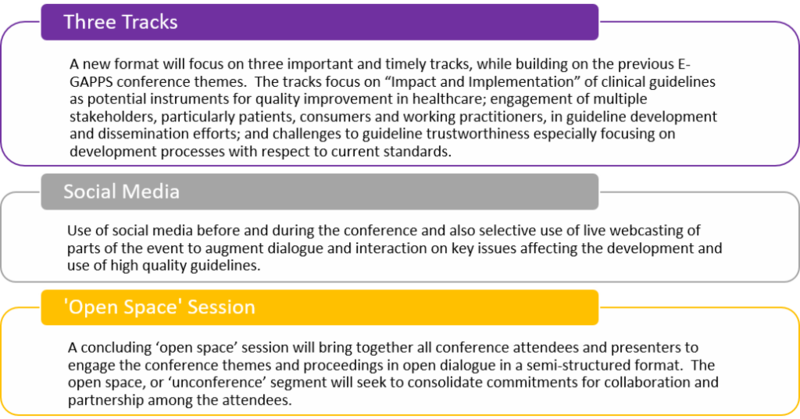 The ‘open space’ process has already begun with social media discussions about important topics, concerns, and challenges encountered by guideline stakeholders. Join the twitter feed: @GuidelinesNA; #EGAPPS3. McGlynn EA, Asch SM, Adams J, et.al. The Quality of Health Care Delivered to Adults in the United States. N Engl J Med. 2003;348(26):2635-2645. Callender T, Woodward M, Roth G, et. al. Heart Failure Care in Low- and Middle-Income Countries: A Systematic Review and Meta-Analysis. PLoS Med. 2014;11(8):e1001699. Berwick DM. Era 3 for Medicine and Health Care. JAMA. 2016;315(13):1329-1330. McGlynn EA, Schneider EC, Kerr EA. Reimagining Quality Measurement. N Engl J Med. 2014;371(23):2150-2153. Mcglynn EA, Kerr EA. 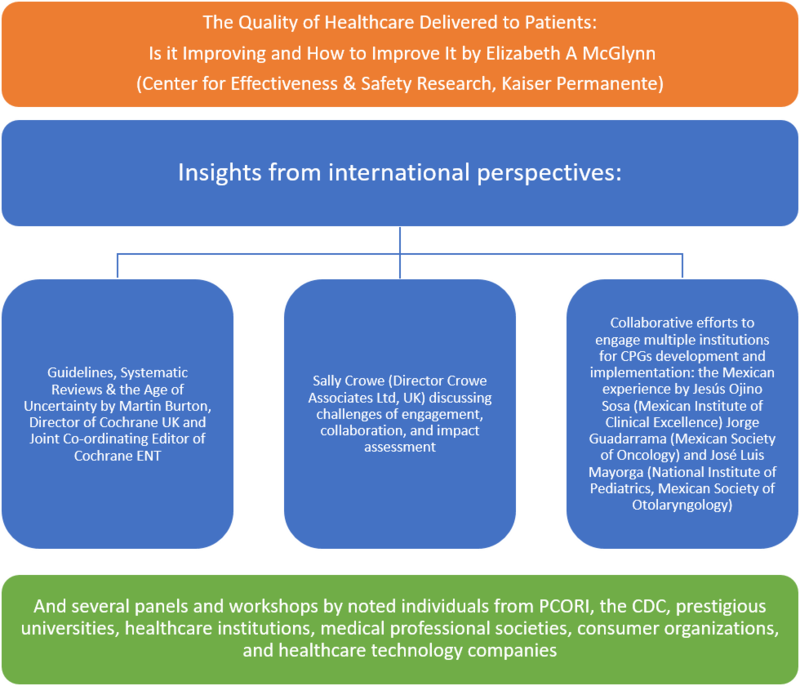 Creating Safe Harbors for Quality Measurement Innovation and Improvement. JAMA. 2016;315(2):129-130.